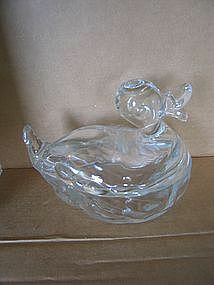 This little covered duck bowl or dish is not new, but not vintage. It is a very heavy glass and measures approximately 6 x 5 x 4 inches. There are no chips, cracks or breaks, but I did find one tiny rough spot of the rim of the lid, which could be damage or a manufacturing issue. I need your zip code to calculate the postage.